Born in Kotak in 1941. Inukpuk began carving as a teenager in camps at Inukjuak, where his family was relocated for educational purposes in the 1950s. His first carving was of an igloo. “I have never been taught, but I learned by watching back then, when we lived in the camps, where there were no White people. That’s how I learned, from watching my father [Johnny Inukpuk] and other carvers” (Inukpuk in Gagnon 1996:13). Animals, kayaks, Inuit fighting bears and making kayaks; mother and child themes dominate later works. He also carved soapstone doll heads for his wife, Elisapee Inukpuk. Inukpuk’s carvings often depict mothers with exaggerated hands, which has the effect, whether intended or not, of emphasizing the concept of nurturing. “I carved according to the shape of the soapstone, but I think I made the hands too large. When the soapstone felt too fragile, I just made the best of it” (Inukpuk in Gagnon 1996:13). Inukpuk was a full-time carver until the early 1980s. He retired when sales dropped, size restrictions were imposed by the marketing agency, and soapstone became scarce. He has only made a few carvings since retiring. “I did enjoy carving, but it is so unprofitable to do it here. I admire those who continue to carve even though it provides such a small income. There were those who were able to continue in spite of the decrease in carving sales. Some, however, could not continue making carvings anymore because of the low price” (Inukpuk in Gagnon 1996:14). 1996 “The Contemporary Living Art,” Inuit Art Quarterly (IAQ), vol. 11, no. 1 (Spring): 13–14. 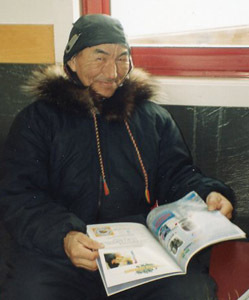 1998 “Charlie Inukpuk: I was never taught,” Inuit Art Quarterly (IAQ), vol. 13, no. 3 (Fall): 46.